Podcast look at everything from the latest news, Fantasy Football, Britball and everything in between! We love to have guests on the show, so if you want to come on and talk about something, get in touch! Our social media handle is @full10yards where you can enter prize giveaways, introduce the show and ask us anything you like, our DMs are open! Time to focus on the draft prospects on offence for this podcast. First up, we announce our 2nd Free Agency signing who will be joining us on the podcast going forward. We go through the latest news including Christian Wade and AAF players joining NFL teams including a reference to an old N64 game (4:13). We then take a look at RBs, WRs and some TEs in this years draft (11:41). Our resident tipster expert tackles the quiz in order to crown a winner from season 1 (53:17) and we round off by talking about Antonio Brown and Green Bay and their love of a domestic (61:13). In today's extra length podcast, we take a look at the early risers and fallers in fantasy football drafts to give you a heads up as to what to expect in 6 months time and some common trends as to why players rise and fall in ADP. PLUS! we have a very special interview with a household name over here on these shores and a surprising thing that he has in common with Lee. We keep you up to date on the latest news including Franchise Tags, combine fallout and a rant on Jason Witten. Duncan from Gridiron Gents tackles the quiz, looking to be the first one to break the 8 barrier! Time to turn our attentions to the NFC and first up we have the East. Some familiar names and voices and some knowledgeable new ones too; We break down East as follows: Cowboys with Patrik [No C] Walker - host of the Star Witness podcast in the US, The Eagles with Daniel Picton - a young Quarterback learning the game here in the UK, Scott Mackay - a writer for a short time here on the podcast covering the Skins and Kickers Matter host Jack Humphrey covers the Giants. Hope you enjoy it! Get your foam fingers out and shut off your alarm clock, it's Super Bowl week! Tim and Lee give you the low down to the big one in Atlanta. How did New England and Los Angeles make it to the big one? And what will be the keys to the game? What makes Brady so great and can McVay wrestle the torch from Belichick where it's the upstarter vs the master. The Fantasy Fam from across the pond tackle our quiz, with a keen eye on a previous contestant's score...Can they beat it? Don't forget to submit your Super Bowl predictions to be on Friday's show and enter our free competition to win an NFL jumper! Head over to our twitter @full10yards for all the info. Drew Brees is the reason there is a podcast today. Why? We'll tell you in the podcast! We recap a set of divisional games that were not up to scratch for one of us but look at why the lower seeds got stuck in the ground. Roger has a couple of plays from the weekend to run the rule over (28:14) and we are joined by a SUPER Bears fan with some #swag for the Full10Questions (42:31). We close out with which broadcasting duos we like and dislike (55:24). Friday podcast! Things are heating up so Tim brings the heat on what Kliff Kingsbury has ruined for him and why Nick Foles is like a 17yr old. Lee gets the Foxboro' jitters with the Chargers travelling to New England and we both again give the Eagles a reason to defy all the odds. Adam joins Tim to rue the double doink costing us our bets from the Wildcard round but look towards the 4 games on the weekend. Before that, NEW SEGMENT alert, The Full10Yards Warm Welcome and an update on the HC vacancies . Enjoy! Some fantastic Wildcard games from the weekend and we have fantastic coverage. Tim and Lee update the Head Coaching vacancies before they recap all the games including whether Houston should consider firing Bill O'Brien and some words for Baltimore fans calling for Flacco. Roger breaks down some of the plays that were under the microscope and had us all searching the rulebooks (36:56). Chris and Adam from 5yardrush join us in the first ever Full10Questions duo contestants. Can they top the leaderboard on a joint effort (59:27)? We finish off with Tim and Lee looking at the Superbowl picture and a handy hint of betting advice on betting on it and confirming the winners of our Full10Yards awards from last week which we put to the Twitter vote(1:06:09)! Shout out to Chris Carpenter, whose intro wins our December competition. Wildcard Weekend, Best Bets & Full10Yards Awards! It's the awards show! First up though, the small matter of January Football! Tim and Lee take you through each of the 4 games and Adam drops by to give us his best bets (23:29) and recap a great season (go check out his website with great previews, www.tdtips.com !). 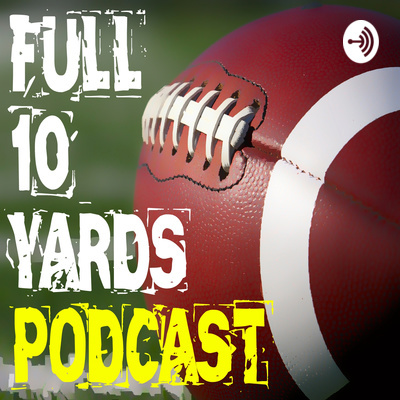 After the bets, it's the inaugural Full10Yards awards (aka the 10s) and we have 10 (get it?) awards to give out (59:50). Some we are undecided on so will put it to the social media vote to decide the winner. Season MVP, Game of the year and the coveted Jason Garrett award. Unfortunately Jason wasn't available to hand the trophy out....too busy masterminding the victory vs the Seahawks.... Shout out to Jason Seely too for the introduction. Don't forget you can all get involved with that, just like our Playoff Predictor competition where you can win an Amari Cooper Jersey! Happy New Year! Tim, Lee and Roger Goodgroves recap all the Week 17 shenanigans including a look at all the current vacant head coaching positions. We all take part in the Full10Questions (some questions harder than others...) before taking a view on the playoffs! 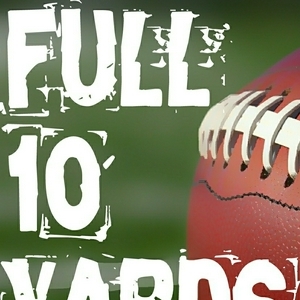 Dont forget to go to full10yards.com/competitions and enter our playoff predictor competition and your chance to win an Amari Cooper jersey! As there was no podcast on Tuesday (xmas and all that...), we squeeze this podcast into a double threat. We answer questions like will the Chiefs Defence cost them a Superbowl? And how should Giants fans be feeling with the news that Eli will be back in 2019... Adam gives us his best bets for the week as does Tim, where the pair have been on top form all season. 3rd podcast of the week sees Tim and Adam give you their best bets for Week 16 but also a special guest Roger Goodgroves comes on to talk all things officials. We talk about the main points of emphasis coming in to the season and what effect that has had and also some specific plays and why they were called as they were. Roger also offers us up a solution to some of the poor officiating we have seen so far! The answer to life's biggest question: How tall is Alfred Blue? Podcast 63 - Week 14 Preview and Punting! Episode 61 - Week 12 Review and so much more! It's Tuesday so Tim and Lee discuss all the previous gameweek's action in the NFL along with regular segments The Full10Questions quiz with this week's guest Rob Grimwood (@FFBritballer). Stinkers and Stonker contenders for last week and look ahead to Week 11's Thursday game between the Packers and the Seahawks along with some waiver wire targets for Fantasy Football. Jason Garrett Corner pays homage to HCs currently under the hot seat and take a look at which ones are not likely to return in 2019. Thanks for all your support and don't forget to enter our November competition where you can win a Larry FItzgerald jersey! simply head over to our pinned tweet (@full10yards) for details on how to enter. Podcast 55- Week 9 Review and so much more! It's the Tuesday podcast so lots to get through including Week 9 recap of all the games, Stinkers and Stonkers of the week. Waivers for Week 10 and TNF. Not forgetting regular Tuesday segments Jason Garrett Corner and everybody's favourite NFL Quiz: The Full 10 Questions sees James Hanmore take on the 10 questions. There are some choice words on the back of the Dallas game from Tim whilst Lee sprays a bit of friendly fire for Jason Garrett Corner! Dont forget to enter our November competition and your chance to win a Larry Fitzgerald jersey from NFL Vintage UK. Head over to our Twitter page and our pinned tweet for details. Thanks for listening, enjoy the podcast! Podcast 54 - Week 9 Preview/Best Bets. F10Y family grows, prize draw winner! Podcast 53 - Week 8 review and trade deadline day! Podcast 51 - Week 7 Review and so much more! Podcast 49 - Week 6 review and so much more! In an action packed show, Tim and Lee are joined by the first ever guest on the Full10Yards Kieran Patterson (@truehybridKP). We recap all week 6 games including a classic in New England, a blow out win for Dallas, a comfortable win for the Chargers and of course, the game in London . We have Jason Garrett corner, waivers for week 7 and a lookahead to TNF. But we also give you our stinkers and stonkers from week 6 and the first in a weekly stint of our quiz, The Full10Questions! If you want to take part in the quiz, slide in to our DMs (@full10yards) and whilst you are there, check out our FREE NFL jersey giveaway! Week 4 is in the books! Tim and Lee are here to review each and every game. 3 Overtime games this week so lots of bonus football, but who impressed, who fell flat and what Cowboys rant will we hear this week? We also give you some waiver wire targets and look ahead to TNF between the Colts and the Patriots. Dont forget our FREE NFL jersey giveaway, check out our Twitter (@full10Yards) and we also want any aspiring fantasy writers out there to get in touch! In the 2nd podcast taking a look at Week 1, we take a look back at the Thursday Night game and the fallout from that. We fill you in on some injury news that could impact the games on Sunday. We are joined by Adam Walford from TouchdownTips to give you our thoughts on the Sunday games. These can be found on the website too. We have "Kickers Corner" giving you a look at whcih kickers to avoid and our kicker of the week brought to you by the Kickers Matter Podcast trio! Finally, we finish off with some quick takes on some fantasy streams, starts, stinkers and sleepers (check out our Twitter for the games starts and sits). Dont forget to join our Last Man Standing and ATS Pick'em competitions! Podcast 35 - WEEK 1 PREVIEW! Frank Scandurro of the Fantasy Football Franchise joins us to gloss over Dynasty Leagues. He answers questions like what a 2019 1st round pick is worth and what the main thing is that you have to remember with Dynasty Leagues. We also talk New Orleans Saints and he leaves us with a fiery Premier League hot take! Before that we run through the latest news in the NFL, Johnny Manziel's debut for the Montreal Alouettes and after we let you know the future plans for the podcast. Frank can be found on Twitter on @Frank_Scandurro. Please spread the Full10Yards word! Adam Walford from Touchdown Tips (@Touchdowntips,TDtips.com) joins us as we speculate to accumulate! We give you a great nugget of advice for betting on the antepost markets and we tell you which song you should listen to when watching any Bills games this year! Great episode! We have £100 of mythical money to spread over markets such as: - Super Bowl/ Conference Outrights, - Division winners, - Most Pass/Rush/Rec yards, - End of season awards - Request a bet specials. The full list will be on the punting page and we encourage you to send us yours! We will keep a track of them all on a spreadsheet and announce the winner at the end of the season! You have to have at least 1 bet in each of the categories to qualify. We "Bear Down" with Luke Campbell and as a treat, I was wearing a special shirt. We got Luke to try and guess which former (and legendary quite frankly) player's name was on the back of my non Bears shirt. We discuss how intriguing the Bears could be and the polarising range of outcomes for the new Matt Nagy offence with Trubisky at the helm. We also play a game of JoHo vs... where Luke goes for the full house! 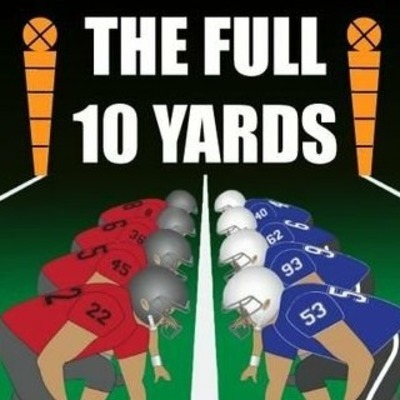 Sam Bloomfield, Manchester Titans QB joins us to talk about everything grass roots football. How much effort is required to succeed? And why is Sam heralded as Mathematician of the week in 1998? Paul Stacey joins us to talk about the Tennessee Titans. Find out who he has branded Brock Osweiler 2.0, why he is so excited about the departure of Mike Mularkey and we play a statistical game involving Marcus Mariota! It's the offseason, and what better way to spend it than by doing a Mock Draft. 12 team standard scoring, picking from slot 4. DUVAAALL. Time to talk about OUR Jacksonville Jaguars with Aarron Warriner! Friend of the show and guest writer Lee Wakefield joins us to hype up my dark horse for next year, the Los Angeles Chargers! Paul Brunt joins us to #KeepPounding to the Panthers tune! Miah joins us to talk about the trendy team of the offseason, the San Francisco 49ers! The first in our #MTMT series as Kieran Patterson joins us to talk about the Superbowl Runners up.